The struggle is real. 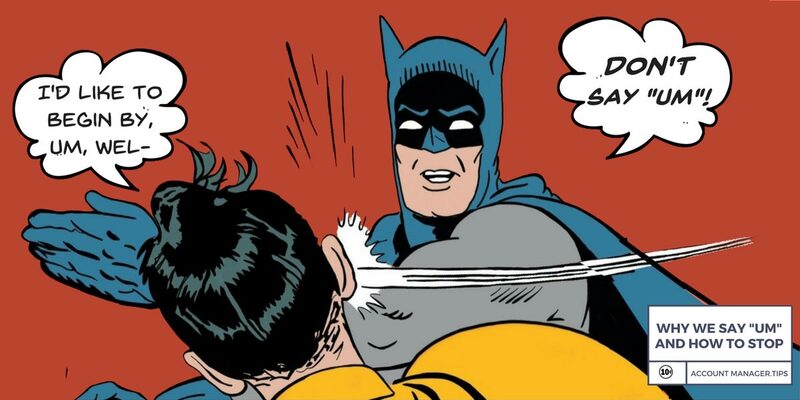 To stop saying um and other filler words when speaking is hard. Really hard. As an Account Manager, it’s inevitable you’ll be asked to present and if you want to make your message understood, then you’ll need to banish those filler words from your vocabulary. Why do we say um and how do we stop? Michael Erard explores why we say um and how to stop using filler words when we speak. 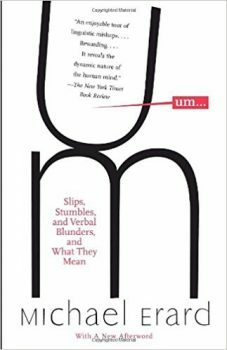 In his entertaining book Um … Slips, Stumbles and Verbal Blunders and What They Mean, linguist and author Michael Errard traces the history of um and uh and doesn’t find a mention of it. He notes that it’s a recent phenomenon (probably due to the invention of the radio) and that most fillers go unnoticed, despite our disdain for them. So why do we use filler words, like uh and um? It’s generally not because of nerves. Stephen D. Cohen, an award-winning public speaker believes it’s because we’re conditioned to answer questions immediately from an early age. When asked something by parents or teachers we responded straight away out of respect or fear of reprisals. Now we feel the urge to speak when spoken to – even if we have nothing to say. signalling that your sentence isn’t finished. Some studies show that we use “um” to signal longer pauses, and “uh” to signify shorter ones. Linguist Mark Liberman believes that we say “um” when we’re trying to decide what to say, and “uh” when we’re trying to decide how to say it. If you don’t think you say “um” or “uh”, it’s possible you may have your own unique filler word. Listen out for it. For example, I’ve noticed a lot of people say “so” instead of “uh” or “um”. Filler words are fine for personal interactions and day-to-day conversations but don’t belong in formal presentations. They can detract from the listener’s ability to understand your message. Here are some tips on how to stop saying um when speaking and banish filler words from your vocabulary. Practice makes perfect so don’t give up if you find you keep saying um when speaking. Rome wasn’t built in a day. Be prepared. Know your presentation and your content inside and out. You don’t need to memorise it verbatim. In fact, it’s better you don’t. Your presentation may not be as engaging and you might come undone if you forget a chunk of text. Rehearse. Read your presentation or your notes out loud. Don’t fill the silence. Take a deep breath instead and use those few seconds to think about what you’re going to say. Put it on paper. Fillers like um and uh are most common at the beginning of a statement or when introducing new ideas. Write down what you are going to say when you segue. Slow down. Speaking more slowly will allow your brain and words to get in synch. Record yourself. How often do you use filler words and when? Are you saying um when speaking or do you have your own filler word? It might help you catch yourself using them next time. What do you think? Any tips on public speaking or how to stop saying um? Share them in the comments below. When and Why Did People Start Saying “Um”? Uh, Why Do We Say Um?